I’m a moderator for a very busy chatroom- The Ordinary and Deciem chatroom on Facebook. There are always many posts on a daily basis and they vary a lot. Some people are showing off their glowing after photos, some are giving their storage ideas for the classic The Ordinary vials. Deciem has really ignited a passion for skincare in the hearts of the masses. The way that Deciem sell The Ordinary- i.e. One active per product has a tendency to confuse. It means rather than grabbing a one size fits all serum, you have to become your own skincare detective and figure out how to get all the actives you need into a regimen that works for your skin. The Ordinary requires you to do your homework. As a result on the Chatroom there are some questions that keep cropping up. I’ll go through these questions and give the best answers I can. Please note I’m not a dermatologist, just a knowledgeable layman who spends a large percentage of her waking life thinking about, using and writing about The Ordinary. (Head to the Deciem website if this is all news to you). Please note that any bit of advice comes with the addendum- USE A GOOD SUNSCREEN. You must use sunscreen, especially if you’re using acids and retinoids. It’s a good idea to patch test new products on a hidden area of skin, like behind the ear or on the leg, to check for allergy. I have a post with all the current regimens suggested by Brandon, this is also worth a read before a Deciem shop. 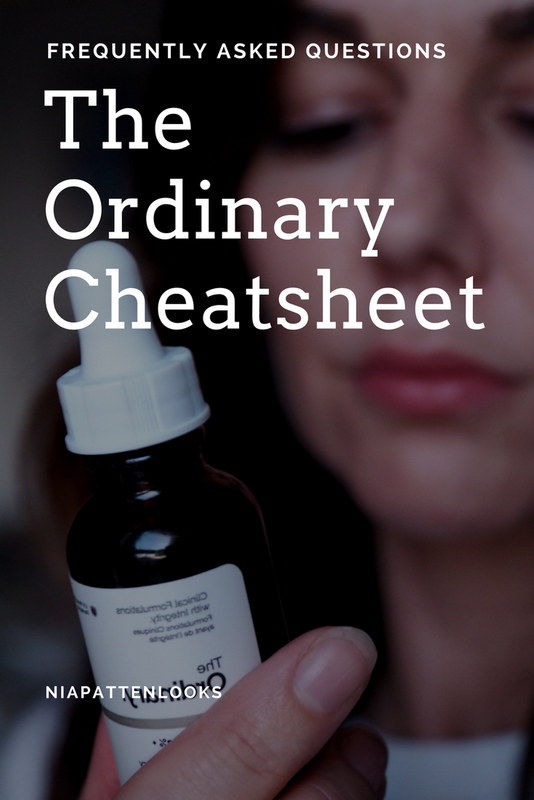 The Ordinary Cheatsheet- All Your Questions Answered! I’ve heard about The Ordinary and I don’t know where to begin, it’s all sciencey. How do I get into it? Chances are you already have some sort of skincare routine. You can start off with The Ordinary by either just picking one thing to start off with or devising a whole regimen. There are sample regimens on Deciem.com or you can email Deciem for a personalised routine. No matter which way you begin with The Ordinary, it’s important to start off by using one thing at a time. So it’ll be very easy to see how your skin reacts to each ingredient. The Ordinary has high concentrations of actives so it’s possible that you will get a reaction. Treat these acids and Retinoids with anything less than measured caution and you’ll run into problems, red itchy problems. I’ve got more than one skin concern, how do I choose a regimen?– Take a good look at yourself, what are you trying to achieve with your skincare. 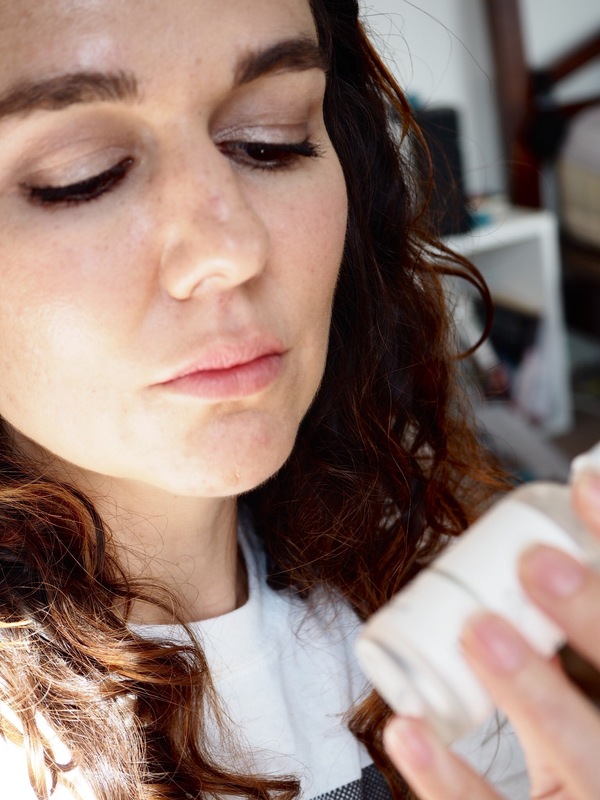 When you have both acne and aging or pigmentation and dry skin (or all of the above for that matter), how does one go about choosing a regimen?Luckily, a lot of The Ordinary products have more than one function. E.g. Azeleic Acid targets acne, but also has skin brightening effects. Retinol and Retinoids are like a silver bullet for skin- normalising the skin and acting on aging, pigmentation and blemishes. For example- I have acne, pigmentation, aging and congestion. I use the persistent acne regimen knowing the Salicylic will decongest my pores, the niacinamide will ease my oiliness and the Retinol will help with wrinkles and pigmentation. If you have sensitive or reactive skin, tread carefully when choosing your regimen- start off with the sensitive or dry regimen before carefully adding in any actives that target other issues. I’ve got my regimen, how do I add this new thing?– Assuming you have slowly introduced your regimen and you have been using it for a few months and your skin is happy, you can try adding something new. The rule of thumb is only three serums and only one strong active at a time according to The Ordinary.com. If your existing regimen includes, say, Azeleic Acid you wouldn’t use Retinol or Vitamin C 30% at the same time. You should use the strong actives on alternate nights. The products go on in order of texture- thin and watery to thick and oily. Apply your water based products in order of preference- so if you’re trying to tackle stubborn pigmentation, Alpha Arbutin should go before Buffet. Always patch test new products and introduce slowly. Should Retinol or Retinoid go over water based products? Brandon advises applying Retinoids over water based serums, as light oil formulations penetrate into the skin better than water. The Retinoid will still absorb through the water serums. You should wait until they are fully absorbed and your skin feels dry before applying the Retinoid. Which Retinoid product should I choose? 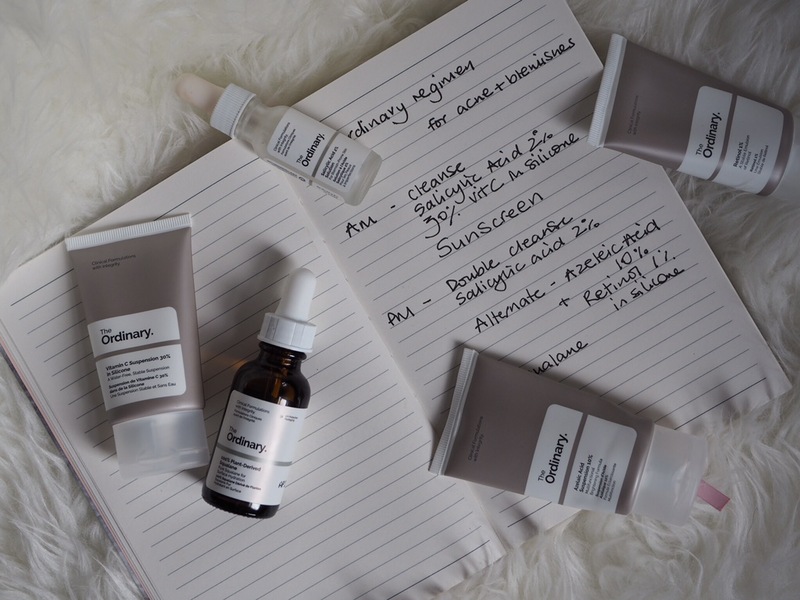 The Ordinary has come out with several new Retin formulas recently. They will be discontinuing 1% Retinol in silicone as it has a history of causing irritation. Granactive Retinoid 5% is Brandon’s recommendation. It has a good concentration of Hydroxypinacolone Retinoate and is not likely to cause irritation, whereas the Retinol formulas will likely cause redness and peeling. You might want to start with a lower concentration of Retinoid if you have sensitive or eczema prone skin. I’ve had a reaction to something, what do I do? It’s happened to the best of us, don’t panic. Step away from the vials. 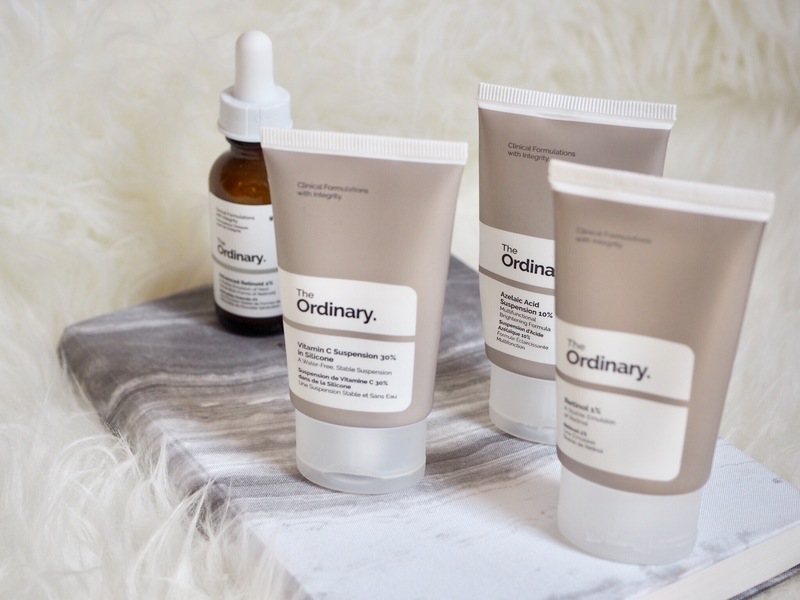 The Ordinary does some meaty concentrations of powerful actives, it’s easy to overdo it in the excitement of working towards perfect skin. If you overdo it, you’re going to hold your progress back. The warning signs include- tightness, dryness, redness, irritation and and an increase in acne. These are your face’s way of telling you to scale back, it’s likely that you have disturbed your skin’s protective barrier. Regain some control by taking a complete break from actives- no acids or Retinoids. Concentrate instead on restoring your skin’s lipid and acid protective barrier. Stick to low pH and oil cleansers, only rinse with tepid water. Use products that will strengthen your lipid barrier- Natural Moisturising Factors is particularly good for that. Wait until your skin is back to normal by a good margin before you gently reintroduce actives. These things are pilling, how do I stop this?– A complaint I often see I the Chatroom is that some of The Ordinary products tend to pill. Pilling is when, after the products dry down and you’re trying to apply foundation or sunscreen, little balls of dry products roll up whe. It’s not nice and it can ruin your makeup. It particularly seems to happen with products containing Hyaluronic Acid and Silicone. The key is to use fewer products, 3 max, and use less of each. Three drops of any serum is enough for the whole face. Rub the drops between the palms and pat into the skin, give plenty of time for things to absorb. I have been using my The Ordinary regimen for a while and it doesn’t seem to work anymore, in fact my skin is really bad now. What’s happened?– There could be a few things at work here. You could be overdoing it, there is such a thing as over exfoliation. If you’re using a few acids, a retinoid, the weekly acid peel and a cleansing brush, your poor face doesn’t stand a chance. Overdoing it can cause open pores, increased oiliness, acne, shiny taut skin and worsening fine lines. Pay attention to what your skin is telling you and scale back. It could also be a specific ingredient that is worsening your skin, you’ll have to do your detective work to figure out which one. Niacinamide is a trigger for lots of people’s acne, others report Hyaluronic Acid and the Advanced Retinoid as causes for their flare ups. If you have an inkling that it might be a specific product then cut it right out and see if things get better.The other cause of worsening skin is Purging. Purging occurs when acids or retinoids temporarily worsen acne (for 4-8 weeks). Purging is the worsening of acne in the area that acne normally occurs- so it doesn’t happen all over the shop. If you come out in spots in places that you don’t normally, it’s probably an ingredient that doesn’t agree with you and it won’t be temporary. It’s a matter of trial and error, but it’s fantastic when things start to go right. I have pretty good skin but I want to use something as a preventative measure– This should be an easy one, but when you’re faced with the myriad of choice available from The Ordinary, it’s tricky to decipher what is what. You want a moisturiser? There’s nothing called “moisturiser”, you want an anti aging serum- they are so many products that target different signs of aging, how does one choose. The first thing you need is sunscreen, which The Ordinary are releasing very soon. Then you should have an antioxidant to prevent environmental damage. You may wish to include a moisturiser, like Natural Moisturising Factors, Hyaluronic Acid or a plant oil. The message is don’t fall into the trap of over ordering when you don’t need to just because things are affordable. If your skin is working fine, there’s no need to upset the apple cart. I have Rosacea, I don’t see a regimen, what should I use? NIOD SDSM mist am and pm helps reduce redness, The Ordinary Azeleic Acid helps with inflammation and Granactive Retinoid 2% normalises the skin, both to be used in the PM only. This is Brandon’s recommended regimen. What The Ordinary regimen is best for Melasma? Pigmentation is very difficult to treat. Anything you try will take a long time to work, and make sure you’re using a broad spectrum sunscreen every day so that you’re not undoing your hard work. Your regimen could include Alpha Arbutin (this requires some patience, it can take many months to show any effect), you may use this twice daily; Ascorbyl Tetraisopalmitate 20% has some studies showing effectiveness, this can be used in the morning under sunscreen; Azeleic Acid 10% then in the evenings alternated with a Retinoid. NIOD has just released an anti pigmentation product called Re:pigment, I’ve just started using it and will report back in due course. Which Antioxidant should I buy? The Ordinary has brought out a couple of new antioxidant serums in addition to the Vitamin C preparations. Vitamin C is a moderate antioxidant which also has a role in supporting collagen and brightens skin tone. Vitamin C can exacerbate acne, so might be one to avoid if you suffer with spots. There is also now Reservatol 3% + Ferulic Acid 3% and EUK 134 0.1%. The EUK 134 is the antioxidant that Brandon Truaxe himself recommends as it has the power to regenerate itself. Reservatol + Ferulic is a powerful antioxidant that can be used twice daily and increases the effects of Vitamin C and E. Antioxidants bond to free radicals in the skin that cause skin damage and speed up the aging process, so they’re a great addition to an anti aging skincare regime for any age. Reservatol + Ferulic is a handy addition to an Ordinary collection as it can be mixed with acidic serums. The Ordinary website says EUK 134 and acids don’t mix, can I use it with acid at all? EUK 134 cannot be blended with anything acidic, as in mixed together with, even the weak acids. It can be used in the same skincare time zone as other acids, like you can use Glycolic Acid 7% then EUK 134, but you can’t use it with the suspensions! i.e. Azeleic Acid, Vitamin C 23% and 30%. Can I use The Ordinary long term, will it cause skin damage? No, there’s nothing to suggest that using acids long term will cause harm or thinning of the skin, so that’s good news. I’ve written about the downsides and upsides of using acids and Retinoids previously. The bad news is that The Ordinary is a gateway drug. 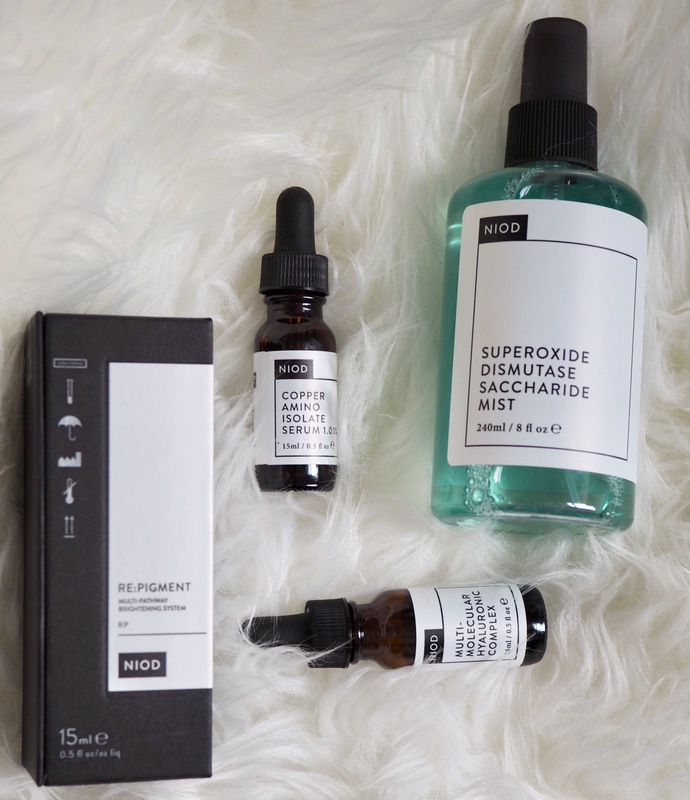 NIOD is Deciem’s most expensive line, it’s focus is long term skin health- healthy skin is beautiful skin after all. I’ve largely converted to NIOD, it’s easier going than The Ordinary. If you’re paying a fiver and getting actual visible skincare results, imagine what Deciem can do with 50 of my pounds. 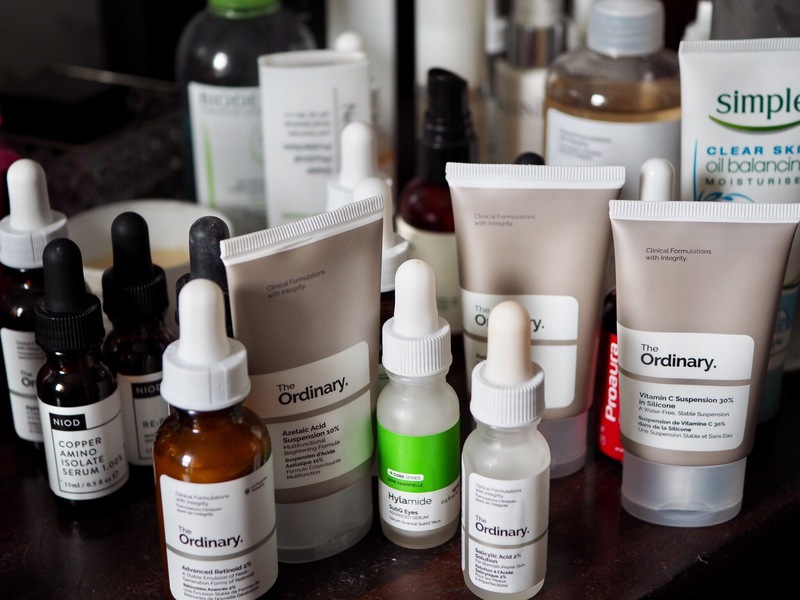 The Ordinary is a fantastic skincare resource, making ingredients with proven effectiveness at decent concentrations available to the masses without a hefty price tag. The key message is to not get overexcited by the wealth of affordable choice- do your homework first and choose a small selection of key ingredients. And use sunscreen. Check out Deciem.com for more information.